On the 21st of May 2013, Antonis Hatzinikolaou has been awarded the honorary “Gina Bachauer” Soloist Award. 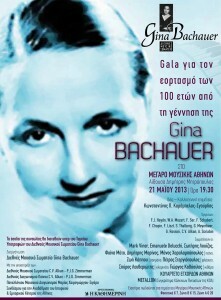 The Gina Bachauer International Music Association celebrated 100 years since the birth of Gina Bachauer, on the 21st of May, 19.30, in the Athens Concert Hall (Dimitris Mitropoulos Hall). The Gina Bachauer International Music Association was founded in 1979 and has set as its main objectives to maintain with every possible means the vivid memory of Gina Bachauer, by offering scholarships to talented young pianists for postgraduate studies abroad and supporting young gifted musicians, both in Greece and abroad. On a regular basis organizes competitions, seminars-master classes and special programs to support new music.